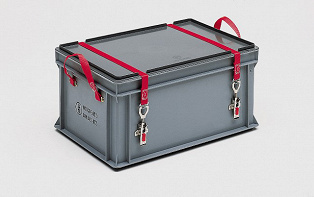 This container is ideally used for transporting goods safely and securely with the lockable straps. | George Utz Ltd. This RAKO GGVS is a hazardous material containers made of plastic, which is approved for the transport of dangerous goods by road. The mass of this container will be 600x400x293mm. The bins is including 2 polyester straps with 2 locking hooks and 2 clamping fasteners.